The ICUSBANDR232 Micro USB to Serial Adapter Cable for Android™ converts the micro USB port on your Android mobile device into an RS232 DB9 connection, letting you control a serial device from the convenience of your smartphone or tablet. 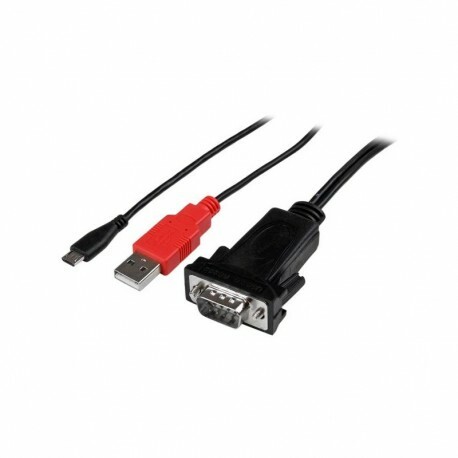 Designed for mobility and integration into mixed environments, this portable and lightweight single cable solution is compatible with nearly all Android OS version 3.2 Honeycomb or later devices including the Samsung Galaxy Note®, Galaxy® S5, S4, S3, or S2, Google Nexus 7™, 5, or 4, and Motorola or HTC mobile devices. The versatile adapter will even work with devices that don’t support USB On-The-Go (OTG)!